“When we do not give children permission to express what they are feeling, they learn to dismiss the truth of what they know, second-guessing what is asked of them and ‘playing it safe.” It’s so important to confirm children when they express themselves. They can feel when we are uncomfortable, so they will bend in order to save us from feeling uncomfortable. All the more reason to deal with our issues. Teachers who teach children with allowing them to blossom and trust are the ones we always remember throughout our whole lives because we were supported to make our choices, and encouraged to grow. You shape the future generation Michelle with your inspiration. Michelle it shows how important a teacher is in supporting trust, care and ultimately in this love with students. It shows what happens when we take education away from grades and make it about truth. What a very real and clear understanding of our children and all we as children have gone through and the need for trust and understanding and being valued for who we are. Michele you are offering to children a new and true way that will revolutionise education learning and society as a whole for the future generations amazing. When we make a child feel safe to make mistakes in their learning and to see that they are not bad as a consequence, we empower a child to explore life to the full, and hence make some extraordinary discoveries on the way. It is a great moment in life when we learn that making mistakes is a natural part of learning. The belief that we have to be perfect and get it right all the time is very damaging and as Michelle shares here, actually retards the true course of education. Michelle, this is a great article, this really stands out for me; ‘These insecurities have the same root cause though because the current model of education suggests that who the children are isn’t enough and that getting things wrong is bad, and therefore they have to try harder, be better etc.’ I have observed this with my son and his friends that they compare themselves to each other academically and think they are ‘bad’ or ‘good’ at certain things, they can be hard on themselves even as young children in school. What we accept as normal is not necessarily Truth and it is good to feel into what is true, because we are run by many thoughts developed over centuries and just because a text is ancient, doesn’t mean it is true. We tend to rely on books and advice from ‘experts’ rather than feel into our bodies. Such a pertinent comment Carmel. We have given our power away so much and have learned to only value knowledge not feeling that our greatest guide, our bodies – ‘the marker of all truth’, is denied and dismissed. Michelle what a gorgeously wonderful and supportive Teacher you are, how fortunate those kids are to be in your class.. and also the rest of the Teaching staff too to have your integrity and leadership in the educating profession. The other thing besides the obvious need for connection when dealing with children is an adult must be able to stand in their natural authority as this is the only way to have a child truly align to you. Its a toxic situation, and imagine if we as children were supported and encouraged to express ourselves rather than a fixed and limited curriculum. We would be inventing jobs based on our expression uniquely brought to the outside world. Truly connecting with children and allowing the space for them to express from their natural connection with their bodies is education for life. From this foundation we are open to explore and learn. I have known that connecting to my own body is key for me to have awareness, to be discerning and to feel sure, with no self-doubt. Returning to this place from my head is still a work in progress but as you say Victoria connection to the body is very natural – so the fact that we don’t do this says much about the hurts we are carrying and how stifled by them we are from such a young age. It is inspiring to read what you are bringing to education Michelle. We live in a spherical world and it doesn’t make sense that for the most part our schooling is set up ‘linearly’. It is no wonder we would have to contort, as a round cannot be reduced to fit into a square hole. What an incredible blessing for your students that they have you as a teacher Michelle. Another friend of mine who also teaches young children shared today that at their students first spelling test she said to them that she would love them the same whatever the result of the test. She had to repeat it 3 times before they got it, then the relief was palpable. So young and yet already defined in their own minds by what they do. It’s teachers like you both who are revolutionising teaching, bringing it back to love first. Connection and making a child feel valued, regardless of chosen patterns of behaviour, or difficulty with learning is the bridge to opening a child up to breaking down blocks and feeling stuck. It supports them to have a go and not fear failing as they know they are held and supported no matter what. ‘Significant others’ have a huge impact on young children Teachers hold this responsibility as being significant in how children shape their lives from these early interactions. 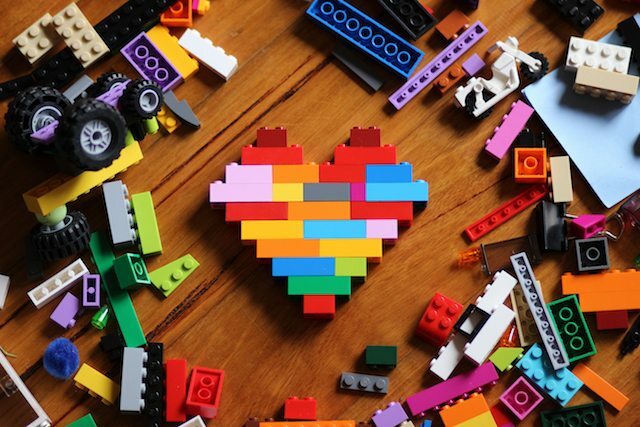 Love your lego story because there is nothing “wrong” with designs falling it is part of the fun and learning but once we label things as right and wrong we take away all the fun, learning and trust. Teaching through the body. This is huge Michelle and I have enormous respect and appreciation of you for changing the way that education is going. A shout out to Joseph Barker who took the gorgeous picture that comes with this blog. Thank you writing this article, Michelle. For putting in words what so many of us feel about the education system and how it has missed the way to support, nurture and inspire our children to have an open and always developing relationship with learning. I love the clarity this is written with. It is so important to understand how we can support our children to be themselves and learn. Education seems like such a simple thing to do, yet the demand is very firmly there to curtail it, complicate it, and remove the truth, simplicity and space needed to facilitate a human being to understand themselves more. The best teachers I have ever had are those that made me feel safe to ask questions – most of my school life I didn’t feel safe enough to speak up about my struggles with spelling or gramma, so just tried my best but recently I have been helped by a friend who is so at ease and open that I feel no hesitation asking even the seemingly simplest or stupidest question and I have found that actually I can learn very quickly when I am able to ask for help. I always felt safe to ask questions – if it wasn’t I simply rephrased my questions or accepted the danger. The best teachers, though, as Rebecca says, made everyone feel safe. We feel safest when we are deeply connected with our bodies for it is here that we feel the warmth and love of our soul. I wonder whether teachers all realise the understanding of the trust you speak of Michele? It is possible to get so caught up in new ways of working schemes that appear to re-invent ways of getting pupils to concentrate or work to get results . If basics of giving a child space to grow and trust were always focused on, I feel learning would develop naturally. Love this Rachel – makes total sense! “This generally causes a lifelong, un-admitted issue with making things look good at the expense of how one is really feeling.” If we do not breathe our own breath, we do not know ourselves and in turn existence and function becomes our everyday normal. This is super true and that non-breathing-of-our-own-breath starts at school under the forces of pressure, competition, tension, doubt, fear etc…each one pulling the child further and further away from their own breath. I know this because it still happens to me now. Any one of these forces and the many others that life can throw at us, can make me not breath my now breath…and then, as you perfectly say Lucinda, I am in function – a puppet. So important that more and more awareness is brought to this and much an important job that teachers do. The harm that is done early on in schools and the ‘education’ system in this way is colossal. Putting pressure on children to learn, perform and achieve a certain level of results I find can greatly damage their confidence. It also takes the joy out of learning and how will this affect them later on in life? Many very elderly people are similar to young children they need to be connected to with loads of love, loving discipline and clear boundaries. How different our ‘school system would be if the way you teach was the norm and not the exception. But all good ideas start with one and multiply, a form of ripple effect. Thank you Michelle. Connection is everything with a child. There can be no trust without it. The influence of teachers on the development of children, and the ease they feel at expressing their qualities is massive. It is crazy how little we look after our teachers and put pressure on them and the children with assessments and the marking process. It strikes me as so unnecessary and avoiding of the real care and nurturing that children need through their school years. Everyone remembers the teachers that truly cared, and this should be our foremost aim, to create a caring system for all concerned. “As teachers, through developing trust we can support our kids to feel at ease, to ‘have a go’ without fear of getting things wrong because they feel valued as a person first and foremost, not judged according to outcomes or results” – that’s just beautiful Michelle, and with myself being in recruitment dealing with people’s careers, jobs, lives, i wonder how such an employee/worker would be given the truth and love of what you say.. and then they changed their jobs, received promotion, because whether school teacher, boss, manager, colleague, we are all each other’s teachers and students at the same time. If only we all simply encouraged each other to be ourselves then our world would be a truly wonderful place to live but we don’t. We try and mould, squeeze, change,adapt, heckle, criticise, steer and influence one another constantly. The pain and strain of this is felt by us all. In time we will all remember that we are exquisite just as we are and we shall learn to stand back and remove our self imposed shackles. How you are with people is truly inspiring Michelle. How wonderful to bring such understanding and love so people get to realise they’ve put blinkers on themselves that restrict their vision to just what is ahead of them and nothing else, that lineal perspective and nothing else. How wonderful that people feel such trust in them through you that they feel they can take off those blinkers and allow themselves to see and feel what’s all around them again. Gotta be relationship and connection above all else. The rest will come naturally from that. It is so important for all of us to…”… feel valued as a person first and foremost, not judged according to outcomes or results.” The devastation of not valuing ourselves ‘first and foremost’ but being someone who produces outcomes or results is exposed in our health statistics. The example you give is very inspiring Michelle… how the students were keen to play, to ‘give it a go without fear’ of being wrong, and in that were able to recognise what worked and what didnt ‘with ease.’ This allowing of space to be themselves offers them so much more learning than we could ever plan. Yes I agree, the learning that happens off record as it were, is the really rich, valuable, life-skills stuff and, in a safe environment, as Michelle has written about, children learn, explore and observe life naturally and intuitively. Michelle you point out what should be the most important learning at school, trust in ourselves. Our systems are set up to de-confirm and not confirm all that we truly are. Imagine an education system where we learn facts and figures yes but where we learn inherently that we are not enough until we know all those facts and figures. Shockingly this is what we have and certainly it was my experience of school many years ago. The truth is no matter our age we know so much more that we are educated to believe. When we feel safe to express what we feel, great wisdoms emerge and age is no barrier to this.